December 31, 2018 | The ice on the headwater lakes of the AWW is 12 to 16 inches thick. Watch for thinner ice in the middle of the lakes and near the thoroughfares. Watch for pressure ridges along the shoreline. There are two ridges starting to form between Farm Point and Gull Rock. Tell someone your travel plans before going on the ice. Storied Lands & Waters of the Allagash Wilderness Waterway: Interpretive Plan and Heritage Resource Assessment - Facilitated and authored by Bruce Jacobson on behalf of the Allagash Wilderness Waterway Foundation. Related materials are the sample lesson plans, watersheds map, and a bibliography available for download at Digital Maine. Signed and numbered by artist Mark McCollough. $50 each + tax, shipping and handling. 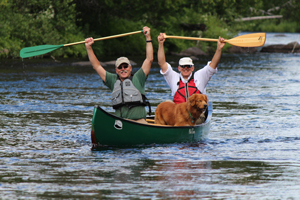 The 92-mile Allagash Wilderness Waterway in northern Maine is one of America's preeminent canoe trips. Established by the Maine State Legislature in 1966 and designated by the U.S. Department of the Interior in 1970 as the first state-administered component of the National Wild and Scenic River System. Henry David Thoreau visited the Allagash region in 1857 guided by two natives of the Penobscot Tribe, Joseph Aitteon and Joe Polis. They made camp on Pillsbury Island in Eagle Lake near what is now the Thoreau campsite. The Waterway's Native American heritage is found in the names of its places, such as Umsaskis Lake and Musquacook Stream. AWW's logging history is tied to the river and locomotives. Remnants of the logging era can still be found by visitors. Call (207) 941-4014 for more information. Northward flow of the AWW often surprises first-time visitors. Whitewater on the AWW - the most well know section is Chase Rapids, a class II stretch just downstream of Churchill Dam. Communication contingency plans are a must as cell phone coverage is spotty and can go down unexpectedly. Self-rescue preparedness is a must. Carry a first aid kit. Plan your trip carefully and add extra days for unexpected weather when you may need to stay off the water. 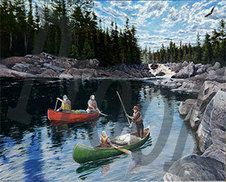 Suggested book: The Allagash Guide: What You Need to Know to Canoe this Famous Waterway by Gil Gilpatrick. Are often remote and require travel over a network of private logging roads. Trailerable and hand-carry boat launches are highly variable. Use the online sortable boat launch listing and the AWW Information Packet to plan your trip.